Jerzon Senador, Accused Dog Abuser - Twitter Trending Topic! Tweeps Want Him Hanged! I'm a dog owner. I have a very smart and cuddly toy doodle named Sugar Ray and I love him like how I'd love my own son. Being with Sugar Ray for more than a year now made me realize that dogs have feelings. They seek to understand their owner's moods, schedules - like, what time we leave for work and what time we arrive home - and temperaments. They want always be around us. If only they could, I think they'd talk to us. Dogs long to play with us and make us happy. They want to feel loved in the same way that they want to make us feel loved; Sugar Ray licks my chin and ears when he feels that I'm becoming too stressed with work. Clearly, there's a reason dogs are called Man's Bestfriend. Unfortunately though, Jerzon Senador - like many of us, who neglect or worse, eat dogs - doesn't seem to understand that. Perhaps amused by his dog's scared look while being in the awkward situation that he had put it in, Jerzon got his camera, took photos of the poor pup and uploaded the images to his Facebook account. I'd imagine that Jerzon thought he'd get comments like "That's so cute!" or "So cool!". To his horror though, he got exactly the opposite. In fact, one of his Facebook friends warned him he could end up in jail for animal cruelty, to which Jerzon arrogantly responded, "Hahaha, hnd ako makukulong noh.. remember senador toh! aquh ng pa2pad ng Animal cruelty at kya kong bawiin yun! 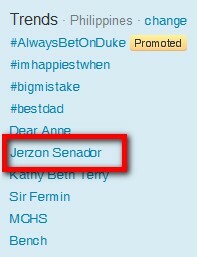 ahahahaha"
Jerzon Senador is currently trending on Twitter and it's all for the wrong reasons. And I can't blame my fellow Tweeps, really. Man is supposed to be the protector, the care-taker of all creation; I think what Jerzon did hardly reflects that. Jerzon has issued an apology via his Facebook account. Kung pwede ko nga lang po kayo isa isahin para makahingi ng tawad ginawa ko na. Sana bigyan nyo ko ng chance para maipakita sa inyo na hindi po ako 'Animal Abuser.' Unexpected ko po talaga na ganito ang mangyayare pero tatangapin ko po kung ano magiging resulta ng ginawa ko. Sa lahat po ng naabala dahil sa ginawa ko humihingi po ako sa inyo ng tawad. (I'd apologize to each of you if I could. Please give me a chance to show you that I'm not an 'Animal Abuser.' What happened was really unexpected but I will accept the consequences of what I have done. To all who were bothered by what I did, I ask for your forgiveness!)" Jerzon, I appreciate that you were able to accept that what you did was wrong. I think everyone deserves a second chance. But you will have to make amends; Take good care of Whitey and of all animals you will encounter henceforth. may katok yata si jerson....pasaway !!!!! Gusto kasi sumikat ni Jerzon Senador baka yan ang benchmark nya ng pagiging tunay na lalake. First of all, I do not know Mr. Senador. I just saw this blog post. I am an animal lover but i say hindi yan animal cruelty. That was not painful to the dog. Nabubuhat ko nga ang mga aso or tuta ko sa balat sa leeg sa likod ng ulo using my two fingers, eh. Hindi naman masakit yan sa aso. Eh, he even used 5 clips, mas lalo nang hindi masakit yun because the weight of the dog was distributed to the 5 pins. It's definitely not animal cruelty. Most people have just overreacted to something which they have not yet analyzed. This Mr. Senador was even humble enough to say sorry for a crime not committed. baliw!!! hindi naman aaray o magrereact ang aso kahit nasasaktan na..
Hi savename, you are an animal lover you say? Then why do you carry your dogs like that (balat sa lee sa likod ng ulo using two fingers)? Seriously, if you were a dog lover, you won't be handling your pet like that because it's improper at all cost. Dogs should be carried using both hands and gently lift them and not according to what you described. Tinawag mo pang animal lover ang sarili mo eh proper handling lang sa aso hindi ka marunong. And don't even try to pacify by explaining that the 5 clips pinned to the puppy's skin was not painful just because the weight of the dog was "distributed". Do your research before you post anything here. And for Jerzon, whether he apologized or not, he should give us the assurance that it won't really happen again. Otherwise, PETA/PAWS will be arriving at his doors. masakit man para sa aso o hindi ang pagsampay sa kanya eh it's still considered animal cruelty. this kid made it even a bigger issue when he posted the picture on fb and said arrogant words towards his act as if it's okay to do so. it's infuriating! dapat mapagsabihan tong bata na toh, maybe kulang sa pag-aaruga ng mga magulang o pangaral. but nonetheless, let's forgive this pathetic kid for he didn't know what he was doing. don't let him commit suicide because of our bullying and defamatory words against him. love your pets, kid. make fun of yourself, not them.